It's been a while since I made macarons, and seeing all the Daring Bakers (I'm afraid I'm out, as I haven't participated for so long now - sorry!) make macarons really made me want to try it again. Feeling all christmas-y, I suddenly realized that christmas macarons would be excellent - my first thought was gingerbread macarons with a white chocolate filling. After some discussions on Twitter and Facebook (Do you follow me? Are we friends yet?) I decided that lemon and ginger would be a better match than white chocolate, so I made my trusty buttercream (not so much mine, it's really Rose Levy Berenbaum's) and flavored it. Delicious!! This recipe makes more buttercream than you'll use for the macarons, so dare I suggest slathering some on soft gingerbread? Maybe gingerbread cupcakes? The possibilities are endless. Bake at 150°C for 15-20 minutes. (I have a convection oven, and 15 minutes is perfect for me.) Let them cool completely before filling. Unused shells can be frozen, or kept in an air-tight container for a day or so. Add the butter, a pat at a time, until fully incorporated. Finally add the ginger and lemon, to taste. Your macs are perfect and I love the seasonal flavors you used. Great macs! Yum! I've been eagerly awaiting your recipe since the sneak preview on your blog. They look & sound delicious. 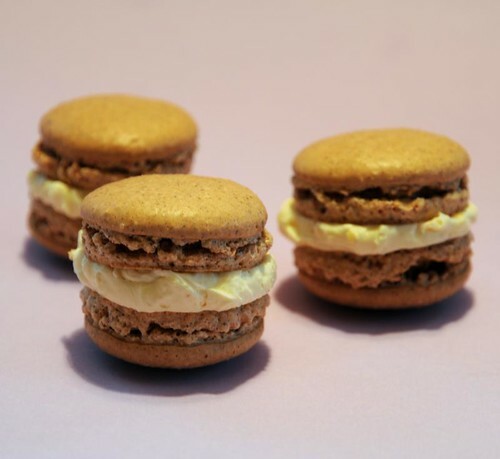 Oh yum these sound fantastic - gingerbread macarons! Inspired. Love the sound of the filling and they look so perfect. Golden syrup - that's what I translate from our "ljus sirap". It's very similar. The "mörk sirap" is similar to treacle or molasses, but maybe a bit runnier. And the white one isn't exactly like a corn syrup but I've found it works well enough in recipes that call for that.